If you have never tried to fry a turkey outdoors, you have been missing out on one of the great gastronomical experiences one can have! Frying a turkey at high temperature not only keeps the meat moist and juicy, but it also locks in all the flavors. Though most people fry turkeys for Thanksgiving and Christmas, it is an outdoors pleasure you could indulge in on any nice day of the year. Traditionally, the frying is done in hot oil and using propane powered cookers. As such, it is an activity recommended to do strictly outdoors to avoid any safety hazards. In hot oil using a propane powered vessel. Without oil using infrared heating in a propane powered vessel. The rest of this article will describe in more detail and compare the two selected turkey fryers to help you decide which would be best for your own needs. Selected Turkey Fryers on Amazon. The Bayou Classic 44-quart Deep Fryer is definitely the top outdoor propane powered deep fryer (with oil) available on the market. Not only can you deep-fry your turkey to perfection, but you can also use it to deep-fry chicken and fries as well as to steam or boil seafood and vegetables. The deluxe turkey fryer's stock pot is made of stainless-steel for optimal durability and easy cleaning, and it is equipped with heavy duty handles for easy transport. 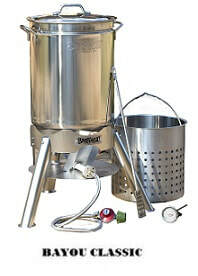 It comes with an elevated perforated basket for steaming and boiling, a stainless brew thermometer and 24 inch stainless stir and mash paddle. Also included is a stainless-steel cooker stand with a rust-free cast aluminum high pressure burner providing 58,000 BTU's of heat and powered by a 10psi LPG regulator hose assembly. The 44-quart capacity pot can easily hold a 20-lb. turkey. It can steam, boil and fry seafood, poultry, vegetables, tamales, etc. The outdoor Char-Broil Big Easy TRU-Infrared Oil-less Turkey Fryer measures 16.3 x 20.8 x 23.5 inches, weighs 28.9 pounds and is also powered by propane, but it does not need any oil to fry your turkey! The fully-enclosed 16,000 BTU propane burners sit inside of a double-wall cylindrical cooking chamber which generates infrared heat that circles the cooker to penetrate and cook the meat evenly, sealing in juices. The result is a bird that’s moist inside and crispy outside, just as fried turkey should be, without the the addition of any oil. With no cooking oil to purchase, and no hot oil to splatter or dispose of, the Char-Broil Big Easy gives you a delicious, safe, and simple alternative to frying with oil. The Infrared technology used here eliminates hot and cold spots, and delivers juicy, crisp, and flavorful results every time. In addition, because your bird is cooked with infrared heat and not with heated oil, you can prepare it with seasoned rubs or injectable marinades, both of which are not an option with traditional fryers. ​The Big Easy allows you to safely cook a turkey (up to 16 lbs.) or chicken in about 8 to 10 minutes per pound, or use it to prepare a variety of other items including roasts, ribs, pork tenderloin, or other large cuts of meat. So which Turkey Fryer is best to buy? If you are looking for the authentic outdoors fried chicken experience, then you should be considering the Bayou Classic 44-Quart fryer. This is truly a superior quality product very safe to use, and you will not be disappointed with the results. It is true that frying in oil is not very healthy, but as long as you indulge in the gastronomical pleasure only once a week or a month, you should not have to worry too much about its adverse effect on your health. However, if you are totally against foods that are deep fried in oil, then you have the option of choosing the Char-Broil The Big Easy. This one does not need any oil to fry your turkey. Note that it is powered by propane. 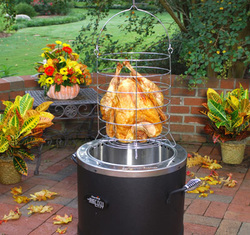 The above two turkey fryers are available on Amazon. Please click your choice below for price information or to purchase. Have you not found yet the product you were looking for?